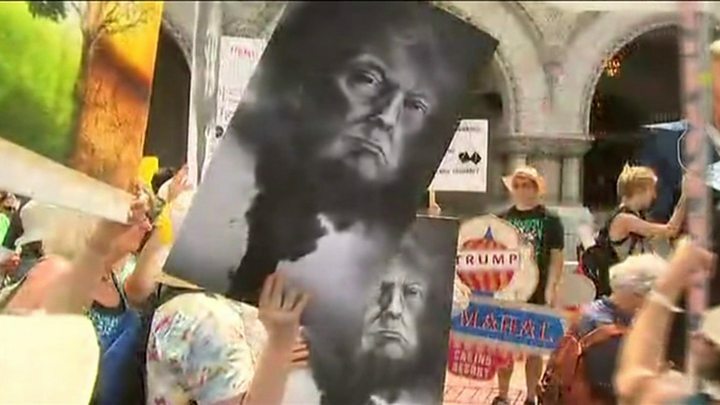 Thousands of people have taken part in protests around the US against the Trump administration's attitude towards climate change. The People's Climate March was timed to coincide with the symbolic 100th day of Donald Trump's presidency. In Washington, a sea of protesters marched from Congress to the Washington Monument past the White House. However, Mr Trump was not there. Instead, he was marking the milestone 100 days at a rally in Pennsylvania. Organisers of the march are critical of Mr Trump's attitude towards climate change. Mr Trump has called climate change a hoax, and has vowed to pull the US out of the Paris Agreement. They are also angry with the rollback of Obama-era environmental protections. Reverend Leo Woodberry, of South Carolina, told a press conference ahead of the march: "We're going to rise up and let them know that we're sick and tired of seeing our children die of asthma. "We're sick and tired of seeing people with cancer because of coal ash ponds. We're sick and tired of seeing sea-level rise." Celebrities, including Leonardo DiCaprio and former Vice President Al Gore, were expected to march as well. The sweltering heat has not deterred them. Their signs read "The seas are rising and so are we"; "Make America think again"; and "There is no planet B." This eclectic crowd of old and young - Buddhist monks and native American groups - are angry at the Trump administration's attitude toward the environment. President Trump has called climate change a hoax. In his first 100 days, he has undone several of his predecessor's environmental regulations in the name of boosting American industry and energy. Organisers say this march will help put the climate debate front and centre in forthcoming elections.